Osteology is the study of bones. Recognizing that not everyone here is completely familiar with all of the relevant names and features, this post will cover a brief tutorial of limb osteology and terminology in dinosaurs. Broadly speaking, anatomists usually divide the skeleton into three sections: cranial (the head); axial (the vertebral column and ribs, although embryological and evolutionary histories mean that parts of the skull are sometimes lumped in here); and appendicular (the limbs). Presently, we’re only interested in the latter. The appendicular skeleton includes forelimbs and hind limbs. Let’s start at the front in this post, and work back in a subsequent post. But before we start that, we need to introduce one more set of terms: proximal and distal (see image for their context within the forelimb). This just refers to the position along a structure relative to the main part of the body. Proximal is close to the body, and distal is away from it. Considering the humerus (upper arm bone), the elbow is at the distal end and the shoulder is at the proximal end. Within the entire leg, your toes are at the distal end and the thigh bone is at the proximal end. The humerus (or “upper arm bone”) fits into the glenoid. It’s a long bone, expanded at both ends for various muscle and bony attachments. Lots of muscles—including the famous deltoids, lats, biceps, triceps, and pectoral muscles—attach here. The “midshaft” of the humerus is exactly that – the point at the middle of bone. A pair of bones – the ulna and radius – form the forearm. They articulate with the distal end of the humerus. They’re pretty simple, rod-like bones in most cases. The ulna usually has a process (i.e. a sticking-out bit), called the olecranon, at its proximal end for attachment of the triceps muscle. Finally, we have the hand – more properly called the manus (Latin for “hand,” strangely enough). The manus has carpals (wrist bones), metacarpals (joining the wrist to the digits), and phalanges. Each digit (or finger) is numbered starting at the thumb. 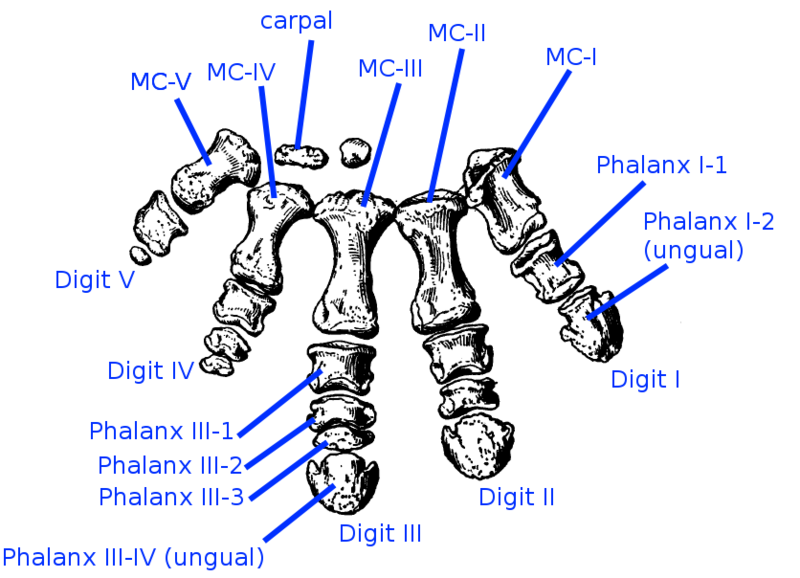 The thumb (innermost digit, for ornithischians) is I (note the Roman numeral), the index finger II, middle finger III, ring finger IV, and pinkie V.
The most proximal elements within the manus (just distal to the ulna and radius) are called the carpals. They’re often just cartilage, and even when ossified are rarely preserved (they tend to float away if the skeleton becomes disarticulated). At any rate, they’re usually non-descript little round elements in ornithischians, and we’ll pretend these bones don’t exist for the purposes of our study. Next, we have the metacarpals. If you squeeze the palm of your right hand between the thumb and index finger of your left, these are the bones you’re feeling. 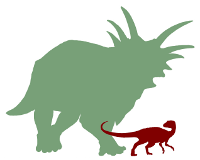 The number of metacarpals is variable in many dinosaurs. Humans, and most ornithischians, have five metacarpals (and hence, five fingers in most cases). Most theropods have fewer. “Metacarpal” is often abbreviated as MC. So, the first metacarpal would be MC-I, and so on. Finally, we come to the phalanges. A single element is most properly called a phalanx (not a “phalange,” although this archaic spelling is not technically incorrect – many older publications use the terminology). The phalanges are numbered by digit (I-V) as well as their position relative to the metacarpals (given by an Arabic numeral). For instance, I-1 is the first phalanx on the first digit, and III-2 is the second phalanx on the third digit. The second-to-last phalanx is sometimes referred to as the “penultimate” phalanx. The distal-most (terminal) phalanx is often modified into a hoof or claw. These specially modified phalanges are usually called unguals, but they are numbered just the same as regular phalanges. Even if the third and final phalanx on the third digit is a huge claw, it’s still called manual phalanx III-3. Finally, we should mention the sternal plates. These odd bones (probably equivalent to the sternum, or breast bone, of mammals) are usually floating at the front of the chest wall. The sternals sometimes look like kidney beans (in ceratopsids) or hatchets (in other ornithischians). It’s a blizzard of terms, but a little practice should help you become completely conversant with all of the parts of the forelimb. 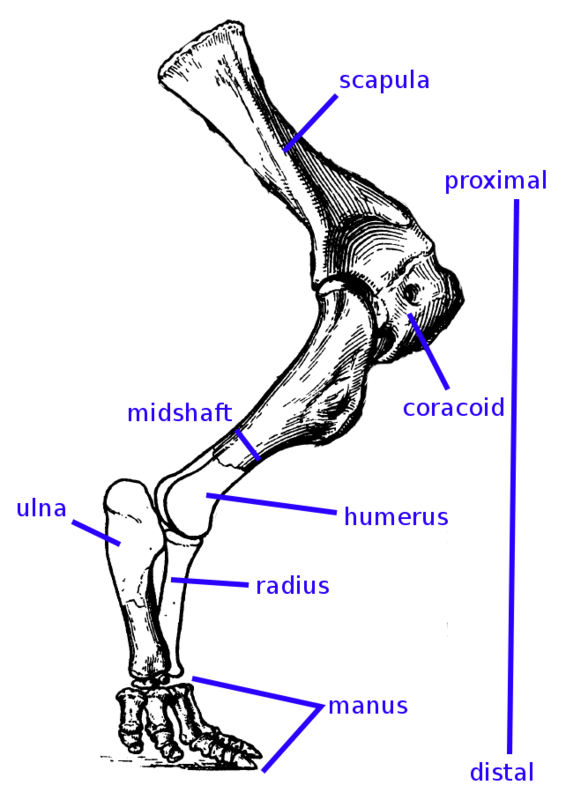 In an upcoming post, we’ll tackle the hindlimb. Don’t worry – many of the concepts are the same! This entry was posted in Key Concepts, Tutorials and tagged osteology. Bookmark the permalink. One other thing on orientation: for some dumb reason, the terms proximal and distal have their sense reversed in the scapula, so that the “proximal” part of the scapular articulates with the coracoid and the proximal end of the humerus. I’ve never understood it, but that’s the way it is — now if you see “distal scapula” you’ll know what they mean. BTW., other authors very sensibly use ordinary directional terms for the scapula instead of proximal/distal. Unfortunately, due to arguments over the orientation of the scapulae in life, the end that’s closest to the humerus might be termed anterior, anteroventral, ventral or inferior (or of course proximal). All very confusing … sorry! Is the “midshaft” the point of smallest circumference? In the picture it doesn’t seem central to any particular measurement. Or is it any uniquely identifiable midpoint, defined according to circumstances, just sufficient to allow comparisons with similar specimens? I can imagine bones that taper monotonically, or that bulge in the middle. It’s hard to know where to choose as the midshaft of the ulna in the picture. Most papers I’ve seen use the smallest circumference as the midshaft reference for numbers specifically, but if there’s any kind of special morphological shape they’ll usually mention it in the text itself. Thanks for the quick lesson! Although…what exactly does the project entail and require of me? Exactly correct, Tor. As we move on to discussing how to standardize measurements for new contributions, this will be something to be. . .uh. . .standardized. Of course, medio-lateral diameters and antero-posterior diameters are another story, too! To answer Nathan’s comment, diameters of the tibia, ulna, etc., are usually not reported, for the very reasons you mention. Not reporting diameters at all seems unbearably lame. I wonder how much information is getting thrown away merely because the bones are an inconvenient shape? Maybe we should defined “midshaft diameter” for these bones as literally the diameter midway down the shaft. (And I think it’s misleading to use “midshaft” for what Tor described — we’d do better to call it “minimum diameter”, which is what it is. Raptor, there is plenty of information on this site about how the project works: check out the tabs along the top. (1) Maturity of the specimen. In juveniles the metaphyseal plate is not sealed or ossified so that the epiphyses may not be preserved together with the diaphysis (at least not in one piece). Does this have any effect determining the “mid distance:? (2) The shapes of bones are the result of mechanical forces acting on the bones themselves. Thus, why does the “mid-shaft” region generally carry the minimal diameter? Is it possible to objectively define a reference cross section bearing minimal stress/Young’s modulus (mid-shaft or otherwise)? By the way, images yanked for use in my anatomy lecture on Friday; I’ll be linking my lecture notes to them eventually. VERY useful!! Yes, minimum diameter is best. The whole “midshaft” thing is a relic of my recent dabblings in human long bone cross sections. Part of the problem, too, with bones of inconvenient shape, is deciding what exactly the various diameters mean mechanically. Measurements are good, but their utility is limited unless we can tie them in to some real-world concept (bending strength is what most people are going for with the diameters). In a tapered element like an ulna, who knows what a mid-shaft diameter actually means? Of course, the degree of taper from end to end very well may be interesting! 1) In animals with epiphyses (dinosaurs don’t typically have ossified epiphyses), this is an issue. . .
2) This is a point that has been debated on multiple levels. Recent work by Lieberman, Demes, and others has started to call into question the presumed 1:1 relationship between bone cross-sectional shape and applied mechanical forces. Not that it’s useless, just that we can’t directly infer the zone of minimum stress from the cross-sectional shape. Things like torsion and curvature in a shaft also alter the calculations. . .so, a “mid-shaft” or a “minimum diameter” are compromise measurements to allow a presumably comparable measurement across morphologically disparate taxa. Thanks, Tom! Glad to hear it’s getting some use outside of the immediate project purposes. The hindlimb tutorial will probably be going up tonight. For bizarre shaped bones, one neat possibility would be to take the proximalmost midshaft diameter, the first minimum diameter (if it’s not the proximalmost portion! ), the first maximum diameter, the next minimum diameter etc., repeating this pattern of minimums/maximums until you reach the distal midshaft diameter. Once the measurements are made, you can come up with a ratio to describe the degree of change within the midshaft from the proximal to distal ends (when compared to the lengths down the midshaft in which they occur). Would be a pain, but could be a quantifiable way to give some previously absent data. Now we just need that portable CT scanner! Pingback: Museums and the Triceratops Posture Problem – Part 1 | DINOSOURS!